Naturally bent has a double meaning in this nativity set. Visually the title refers to the posture of the figures in this set. Like two waves coming in from different directions, the joyful piety of the holy couple and the wisemen is closing in on and literally envelops the baby in the manger. There is grace in their movement, and tenderness in their respectful gesture. And, there is nothing artificial about these figures: They are naturally bent. However, "naturally bent" also refers to the physical reality of the characters. Indeed, they are made of cow horns. Using naturally bent cow horns, the artists transformed them into the darling figures of this set. Each culture has its own way and materials to represent the Nativity. Frequently, the materials are taken from the common riches of a country. But no material is worthless. In Christ's birth all of human reality and nature achieves new value and nobility. 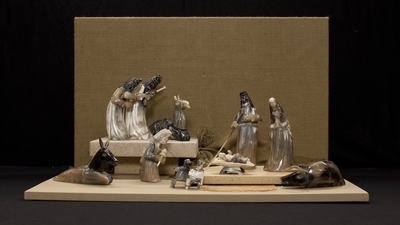 Figures carved from cow horn by artists from Chile, depicting the nativity of Jesus. The date of creation is unknown. Exhibition label originally written by Fr. Johann G. Roten, S.M. for exhibit entitled "At The Manger" and held at Roesch Library, University of Dayton.